Now 960 tips can sit on the lab bench using the same surface area as one rack. “Every ten cards of CleanPak comes with one rack base and lid, thereby making what little packaging we have usable rather than just waste. This base can also be used in the lab as a single well reagent reservoir,” says Motadel. 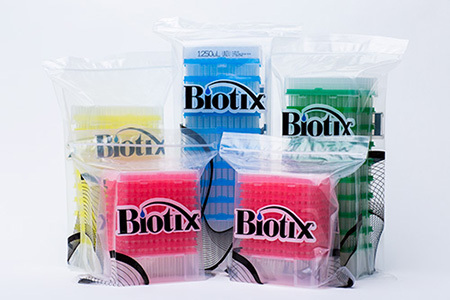 CleanPak accompanies the B3™ rack which houses both the Biotix uTIP™ Universal Pipette Tips and xTIP® Pipette Tips engineered for Rainin LTS-style pipettors. The B3 rack itself is designed for efficiency with a low environmental footprint. The rack uses less plastic than leading racks while maintaining a SBS stable footprint. The rack and the reload sleeves are both clear for easy identification and the tip cards are color coded based on tip volume. "Our focus is to bring improvements through innovation while drastically reducing the waste that is associated with consumables”, explains Arta Motadel. “CleanPak not only uses 60% less plastic and paper waste on an average over other re-load products, but it delivers a product that is truly contamination free. CleanPak is the only re-sealable reload system on the market that is hermetically sealed. It’s not just recyclable but reduces waste with reusable components." CleanPak is available now for uTIP (for universal pipettes) and xTIP (for Rainin LTS) non-filter pipette tips in sizes ranging from 10 μL to 1250 μL.